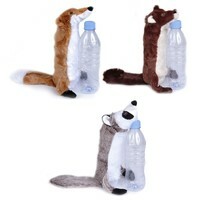 Animate Bottle Fill Wild Animal Squeaky Dog Toy is the perfect way for your dog spends hours of their time having fun. Especially designed so that a 500ml bottle can be inserted, this toy makes and excellent gift for dogs who love chewing bottles. Using this toy, your dog will still retain all the fun of the bottle chewing, in particular the crinkling sound, but prevents that awful mess made when the bottle is shredded! Made from durable material, this Animal Dog Toy will withstand lots of chewing fun from your pet! Sadly yet to find a water bottle that fits into this - have tried the 500ml evian and highland spring bottles and both are too big. So at the moment this is just a sad little roadkill toy that my dog has no interest in!